While the Zero 1.3 and the Zero W have limits set to 1 per order, the Zero WH has no limits. Finally you can buy as many as you need to complete that project. 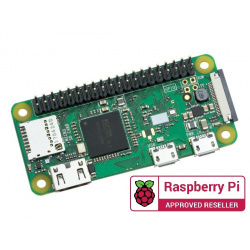 This third generation model maintains the same popular board format as the Raspberry Pi 2 and Raspberry Pi B+, but boasts a faster 1.2GHz 64Bit SoC, and on board WiFi and Bluetooth! Maximum 1 Unit Per Customer. We Reserve the Right to Cancel Repeat Orders. The Official Raspberry Pi Power Supply - Shipped with easily interchangeable heads for the UK and EU. Limited to 1 RPI Zero per customer (including units included in kits), we reserve the right to cancel duplicate and/or multiple orders. The official raspberry pi wifi dongle. 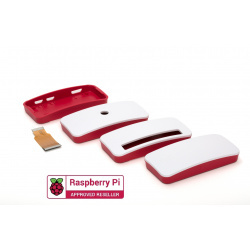 The Official Raspberry Pi Zero & Zero Wireless Case is now available! 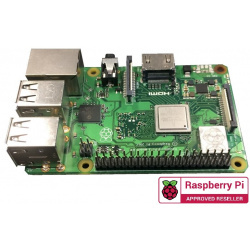 The Raspberry Pi 3 Model B+ is the latest product in the Raspberry Pi 3 range, boasting a 64-bit quad core processor running at 1.4GHz, dual-band 2.4GHz and 5GHz wireless LAN, Bluetooth 4.2/BLE, faster Ethernet, and PoE capability via a separate PoE HAT. The dual-band wireless LAN comes with modular compliance certification, allowing the board to be designed into end products with significantly reduced wireless LAN compliance testing, improving both cost and time to market. The Raspberry Pi 3 Model B+ maintains the same mechanical footprint as both the Raspberry Pi 2 Model B and the Raspberry Pi 3 Model B. Please Note. It is recommended to use a 2.5A Power Supply with the Raspberry Pi 3 B+. until at least January 2023. This product should only be connected to an external power supply rated at 5V/2.5 A DC. Any external power supply used with the Raspberry Pi 3 Model B+ shall comply with relevant regulations and standards applicable in the country of intended use. This product should be operated in a well-ventilated environment and, if used inside a case, the case should not be covered. Whilst in use, this product should be placed on a stable, flat, non-conductive surface and should not be contacted by conductive items. The connection of incompatible devices to the GPIO connection may affect compliance, result in damage to the unit, and invalidate the warranty. All peripherals used with this product should comply with relevant standards for the country of use and be marked accordingly to ensure that safety and performance requirements are met. These articles include but are not limited to keyboards, monitors, and mice when used in conjunction with the Raspberry Pi. The cables and connectors of all peripherals used with this product must have adequate insulation so that relevant safety requirements are met. Do not expose to water or moisture, or place on a conductive surface whilst in operation. Do not expose to heat from any source; the Raspberry Pi 3 Model B+ is designed for reliable operation at normal ambient temperatures. Take care whilst handling to avoid mechanical or electrical damage to the printed circuit board and connectors. Whilst it is powered, avoid handling the printed circuit board, or only handle it by the edges to minimize the risk of electrostatic discharge damage. 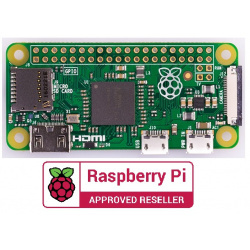 The Raspberry Pi Zero WH has landed at PiShop! The Raspberry Pi Zero is an ultra low cost and ultra small variant of the original Raspberry Pi. It's tiny, measuring just 65mm x 30mm, and is perfectly designed for embedded applications, wearables, prototyping and any other Pi based tinkering you can think of, on a micro scale! The Raspberry Pi Zero Wireless features on board Wireless Internet & Bluetooth for all your connectivity needs! The Raspberry Pi Zero features a BCM2835 chipset, overclocked to 1Ghz with 512MB RAM, and the same 1080p video output, so there's plenty of oomph in that little board. It also features the same 40 pin GPIO layout as the Raspberry Pi 2/B+/A+, with a pre-soldered male header. With it's small form factor and reduction in connectors, the Raspberry Pi Zero only uses ~ 140mA at 5V! Unlike it's larger brothers and sisters, the Raspberry Pi Zero has an unpopulated composite (RCA) header and an unpopulated reset header. There's also no DSI screen port, no ethernet, no analogue audio and no full sized USB ports. Instead, the Pi Zero features a micro-USB power port, a micro USB OTG host port (for peripherals e.g. WiFi dongle), and a mini HDMI port for video. Tiny Current Draw ~ 140mA at 5V! The Raspberry Pi 3 Model A+ is the latest product in the Raspberry Pi 3 range. 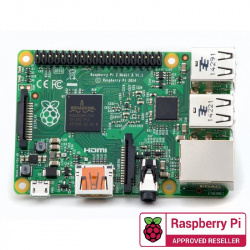 Like the Raspberry Pi 3 Model B+, it boasts a 64-bit quad core processor running at 1.4 GHz, dual-band 2.4 GHz and 5 GHz wireless LAN, and Bluetooth 4.2/BLE. The dual-band wireless LAN comes with modular compliance certification, allowing the board to be designed into end products with significantly reduced wireless LAN compliance testing, improving both cost and time to market. The Raspberry Pi 3 Model A+ features 512mb SDRAM (over the Pi 3 B+'s 1GB), has no Ethernet port or function, and includes only one USB port. The Raspberry Pi 3 Model A+ has the same mechanical footprint as the Raspberry Pi 1 Model A+. Please Note. It is recommended to use a 2.5A Power Supply with the Raspberry Pi 3A+. This purchase is for the Raspberry Pi 3 Model A+ Board only. 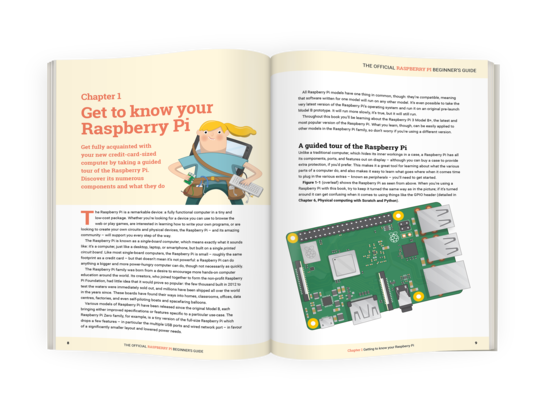 This 244-page official Raspberry Pi book is crammed with projects and beginner’s guides containing all the information you need to get started using your new computer! 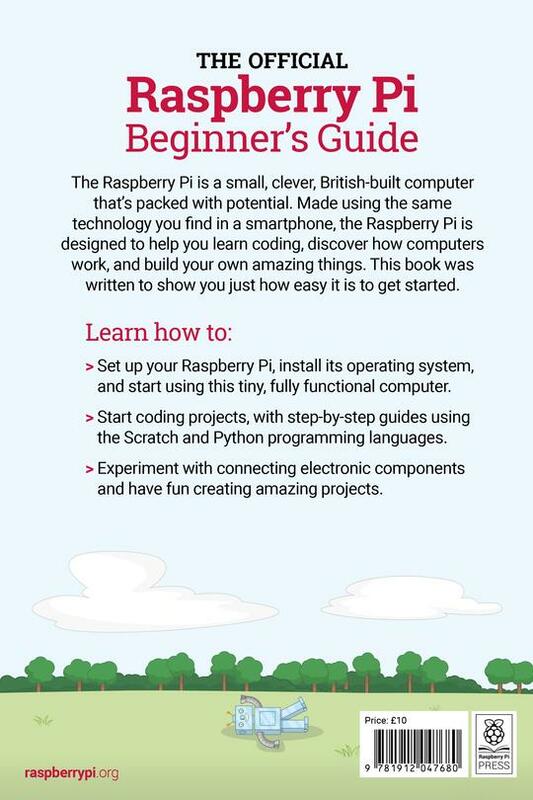 Learn how to set up the Raspberry Pi, install an operating system, and start using it. 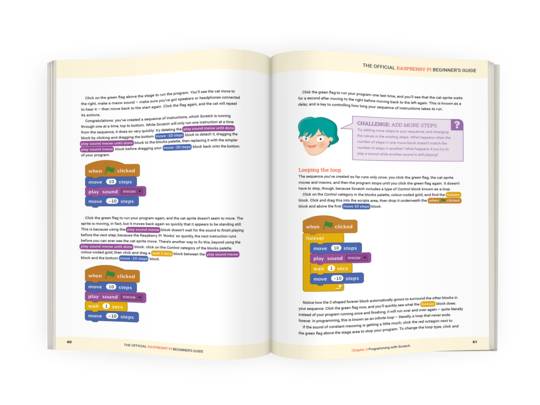 Follow step-by-step guides to code your own animations and games, using both the Scratch and Python languages. Create amazing projects by connecting electronic components to the Pi’s GPIO pins. Plus much, much more! Maximum 1 Unit Per Order. If you require Raspberry Pi Zero Wireless in bulk, we allow quantity purchases of the Raspberry Pi Zero Wireless with pre-soldered headers! 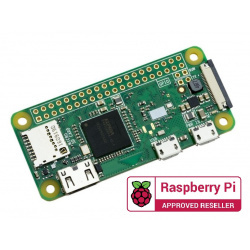 The Brand New Raspberry Pi Zero Wireless has landed at PiShop! The Raspberry Pi Zero is an ultra low cost and ultra small variant of the original Raspberry Pi. It's tiny, measuring just 65mm x 30mm, and is perfectly designed for embedded applications, wearables, prototyping and any other Pi based tinkering you can think of, on a micro scale! 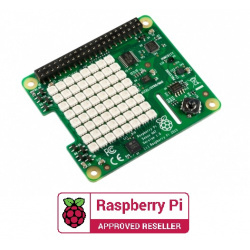 The Raspberry Pi Zero Wireless features on board Wireless Internet & Bluetooth for all your connectivity needs! The Raspberry Pi Zero features a BCM2835 chipset, overclocked to 1Ghz with 512MB RAM, and the same 1080p video output, so there's plenty of oomph in that little board. It also features the same 40 pin GPIO layout as the Raspberry Pi 2/B+/A+, which you'll need to solder your own headers to. With it's small form factor and reduction in connectors, the Raspberry Pi Zero only uses ~ 140mA at 5V! Unlike it's larger brothers and sisters, the Raspberry Pi Zero has an unpopulated GPIO, unpopulated composite (RCA) header and an unpopulated reset header. There's also no DSI screen port, no ethernet, no analogue audio and no full sized USB ports. Instead, the Pi Zero features a micro-USB power port, a micro USB OTG host port (for peripherals e.g. WiFi dongle), and a mini HDMI port for video. The below is a copy from https://www.raspberrypi.org/help/faqs/#powerReqs. Note: As this product is limited to 1 per customer; We reserve the right to cancel multiple and/or duplicate orders. This tiny wireless adapter is easy to use and easy to set up. If you are tired of dealing with all those messy wires to connect your Raspberry Pi to your network then this is the item you need. It's also got the Raspberry Pi Foundation's logo embossed! It also works as a wireless access point, handy for configuring your Pi on the go. 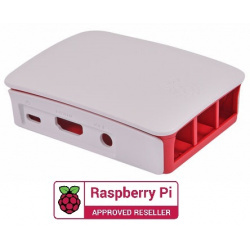 The Official Raspberry Pi Zero & Zero Wireless Case is now available! Specially made and beautifully crafted in red & white, this nifty and tactile snap-together case is designed to protect your Zero! Solid lid, for those who want an all around protected Zero! Some mini-HDMI cables will need to have their shroud's cut down to fit the official case. 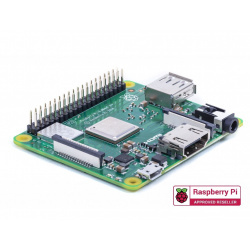 The Raspberry Pi 2 Model B has landed at PiShop! The ultra-low-cost, deck-of-cards sized Linux computer has had yet another makeover, this time the Raspberry Pi Foundation have gone all out! The Raspberry Pi 2 Model B is on a completely new level to its predecessors by being a staggering 6x faster than the Raspberry Pi Model B+. 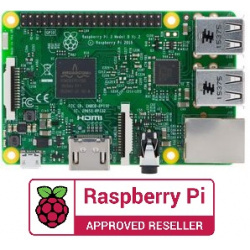 Back-Compatibility note: The Raspberry Pi 2 Model B has the same footprint and layout as the previous Model B+ version, so will fit all Model B+ items. Identical board layout and footprint as the Model B+, so all cases and 3rd party add-on boards designed for the Model B+ will be fully compatible. 40pin extended GPIO to enhance your “real world” projects. GPIO is 100% compatible with the Model B+ and A+ boards. First 26 pins are identical to the Model A and Model B boards to provide full backward compatibility across all boards. Micro SD slot for storing information and loading your operating systems. The eagerly awaited 7" Official Raspberry Pi Touchscreen Display is finally hear! 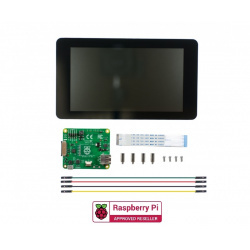 Boasting a neat 800×480 display @ 60fps resolution, and 10 point capacitive touchscreen, this 7" screen for the Raspberry Pi gives users the ability to create all-in-one, integrated projects such as tablets, infotainment systems and embedded projects. The 800x 480 display connects via an adapter board which handles power and signal conversion.Only two connections to the Pi are required; power from the Pi’s GPIO port and a ribbon cable that connects to the DSI port present on all Raspberry Pi’s. Touchscreen drivers with support for 10-finger touch and an on-screen keyboard are available on the latest Raspbian OS for full functionality without a physical keyboard or mouse. Turn your Raspberry Pi into a touchscreen tablet, infotainment system, or standalone device. Truly Interactive - the latest software drivers will support a virtual ‘on screen’ keyboard, so there is no need to plug in a keyboard and mouse. Make your own ‘Internet of Things’ (IoT) devices including a visual display. Simply connect your Raspberry Pi, develop a Python script to interact with the display, and you’re ready to create your own home automation devices with touchscreen capability. A range of educational software and programs available on the Raspberry Pi will be touch enabled, making learning and programming easier on the Raspberry Pi. Connects to the Raspberry Pi board using a ribbon cable connected to the DSI port. Adapter board is used to power the display and convert the parallel signals from the display to the serial (DSI) port on the Raspberry Pi. N.B. Will require the latest version of Raspbian OS to operate correctly. Please Note. The Raspberry Pi Board and accessories are not included in this kit. The Sense HAT is an add-on board for Raspberry Pi, made especially for the Astro Pi mission! It’s going to the International Space Station in December 2015 – and is now available to buy from PiShop. The Raspberry Pi Foundation have also created a Python library providing easy access to everything on the board. Each of these measurement channels has 16 bits of resolution. The LED matrix is driven by a combination of a constant-current LED driver and an Atmel ATTiny88 running a custom firmware that delivers an 8×8 display with 15-bit resolution RGB colour. If you want to get into the gory details, the AVR firmware is available on Github. The Atmel is responsible for sampling the joystick. We didn’t have enough pins left on the Atmel to dedicate the five that we needed to sample the joystick axes independently, so they’ve been spliced into the LED matrix row selects. The joystick gets updated at approximately 80Hz, which is the scan rate of the LED matrix. All of the sensors (and the base firmware for the Atmel) are accessible from the Pi over I2C. As a fun bonus mode, the SPI peripheral on the Atmel has been hooked up to the Pi’s SPI interface – you can reprogram your HAT in the field! We use this method to get the firmware into the Atmel during production test – and we leave it unprotected so you can substitute the stock firmware to get it to do whatever you want. Seriously. First person to turn this sensor HAT into a quadcopter controller HAT wins a cookie from me. When the install has finished you will need to reboot your Raspberry Pi! PLEASE NOTE: Rapsberry Pi not included. Protect your new 7" Raspberry Pi Touchscreen with this premium black case! Designed to house a Raspberry Pi B+/2/3 and the official 7" LCD Touchscreen, it leaves the touchscreen front and Raspberry Pi ports fully available, but encloses the unit completely. It's also fitted with two non-slip rubber feet, and an edge bezel that improves the appearance of the screen, whilst keeping the board neatly tucked away behind it. It's even got a slot in the top for the Raspberry Pi camera! The Raspberry Pi Camera Module V2 is the new and improved official camera board from the Raspberry Pi Foundation! 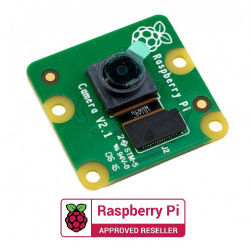 Custom designed and manufactured by the Raspberry Pi Foundation in the UK, the Raspberry Pi Camera Board V2 features an ultra-high quality 8 megapixel Sony IMX219 image sensor (up from 5MP on the V1 camera board), and a fixed focus camera lens. The V2 camera module is capable of 3280 x 2464 pixel static images, and also supports 1080p30, 720p60 and 640x480p90 video. The module attaches to Raspberry Pi by way of a 15 Pin Ribbon Cable, to the dedicated 15-pin MIPI Camera Serial Interface (CSI), which was designed especially for interfacing to cameras. The CSI bus is capable of extremely high data rates, and it exclusively carries pixel data to the BCM2835 processor. A 150mm CSI cable is included with every camera. The board itself is tiny, at around 25mm x 23mm x 9mm, and weighs just over 3g, making it perfect for mobile or other applications where size and weight are important. The NoIR Camera V2 is the “night vision” version of the official camera board released by the Raspberry Pi Foundation. The Raspberry Pi NoIR Camera Board V2 has no Infrared filter, which makes it perfect for taking Infrared photographs or photographing objects in low light (twilight) conditions! 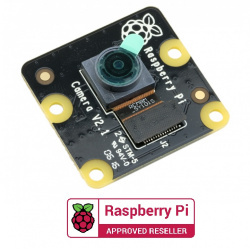 Custom designed and manufactured by the Raspberry Pi Foundation in the UK, the Raspberry Pi NoIR Camera Board V2 features an ultra-high quality 8 megapixel Sony IMX219 image sensor (up from 5MP on the V1 camera board), and a fixed focus camera lens. The V2 camera module is capable of 3280 x 2464 pixel static images, and also supports 1080p30, 720p60 and 640x480p90 video. The module attaches to Raspberry Pi by way of a 15 Pin Ribbon Cable, to the dedicated 15-pin MIPI Camera Serial Interface (CSI), which was designed especially for interfacing to cameras. The CSI bus is capable of extremely high data rates, and it exclusively carries pixel data to the BCM2835 processor. The Raspberry Pi Compute Module 3 (CM3) is a DDR2-SODIMM-mechanically-compatible System on Module (SoMs) containing the same processor, memory, and supporting power circuitry as the Raspberry Pi 3. Flash memory is connected directly to the processor on the board, but the remaining processor interfaces are available to the user via the connector pins. You get the full flexibility of the BCM2837 SoC (which means that many more GPIOs and interfaces are available as compared to the Raspberry Pi), and designing the Module into a custom system should be relatively straightforward as all the tricky bits are pre-built into the module. 4 GB eMMC Flash memory. Also these modules have extra input/output (I/O) interfaces in addition to the Raspberry Pi model A/B boards.